To showcase Texas’s live fire cooking obsession, this year’s Austin Food & Wine Festival featured four fire pits where a roster of star chefs collaborated on incredible dishes. To showcase Texas’s live fire cooking obsession, this year’s Austin Food & Wine Festival featured four fire pits where a roster of star chefs collaborated on incredible dishes. “There is just something extra special that happens around the pit every year,” says Dave (“Oven Dave”) Eberhardt of the Texas Oven Co. “It’s a wood-fueled carnival ride.” Here, the meaty highlights from the pits. 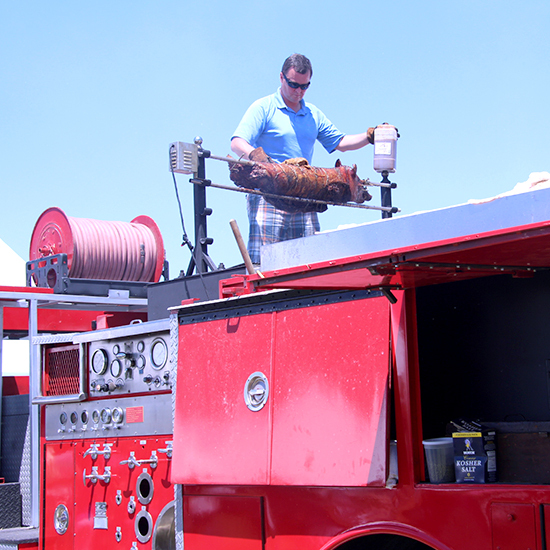 For the second year in a row, Jack Gilmore of Jack Allen’s Kitchen roasted a pig atop his shiny red rotisserie fire truck. The 1986 Seagrave Super Pumper was procured via eBay and then tricked out with things like built-in beer taps by Gilmore and his team. The truck isn’t Gilmore’s only impressive BBQ innovation; he also brought back his carousel-like spinning chicken whirl-a-gig. On Saturday night, Jack’s son Bryce Gilmore, Sam Hellman-Mass and Mark Buley of Odd Duck arrived at the festival around 11:30 p.m., after finishing up a busy dinner service. They roasted a fatted calf through the night, taking turns napping, then sliced it up on Sunday and served it on freshly baked flatbread with pepper paste and yogurt sauce. Terrence Gallivan and Seth Siegel-Gardner of The Pass and Provisions in Houston brined beef legs from 44 Farms for two weeks before smoking them for 12 hours on a pulleyed tripod system built for the festival by Klose Pits. The smoky corned beef was served with a Thousand Island cabbage slaw on freshly griddled rye tortillas. While almost all the fire pits were manned by Texans, Pat Martin of Martin’s Bar-B-Que and Tandy Wilson of City House were there representing Nashville. “We wanted to bring a little Tennessee to Texas,” says Martin, who cooked a traditional West Tennessee-style whole hog for 24 hours, then served pork sliders with slaw. Wilson prepared a ham sausage he developed at Martin’s smokehouse this winter by marrying Italian technique with the flavors of a Southern breakfast sausage.